The bonds had irrevocably been broken. And time would not heal the emotional scars of mutual self-interest. The collision course could no longer be avoided in Pittsburgh — the star wide receiver fixated on his freedom and armed with significant leverage against an NFL franchise focused on restoring order and peace within its locker room. No one knows if he’ll wins games, make the playoffs or catch 1,200-plus receiving yards again in Oakland (or Vegas), but all that matters in this moment is that Brown found a better situation for him — i.e., a suitor willing to finally compensate him for what he is: one of the best receivers in the league. For years, he was that playmaker in Pittsburgh; that constant threat, that target poised to do damage against defenses. But the damage done to his relationship with quarterback Ben Roethlisberger and coach Mike Tomlin was a transgression the Steelers could not bear to live with. So instead of retaining his talent and staying the course toward reconciliation, the organization went to great lengths to rid itself of Brown after running back Le’Veon Bell sat out the entire 2018 season. The Steelers shockingly showed they are willing to eat $21.1 million in dead money just to part ways with one of the game’s greatest playmakers. But Brown and Bell’s departure doesn’t mean the “circus” has fled Pittsburgh altogether. 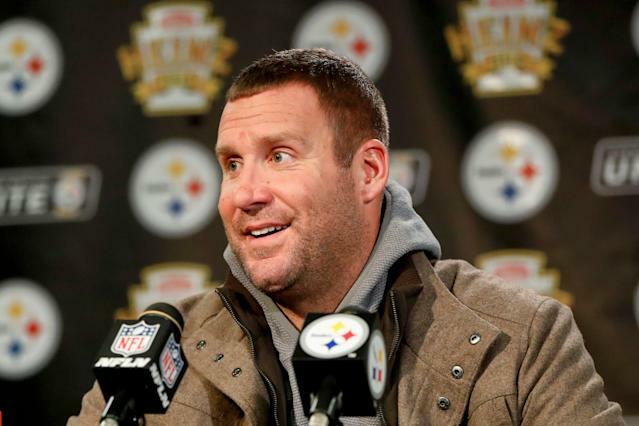 With no scapegoats left to blame, the state of the Steelers now rests on the shoulders of Roethlisberger, the 37-year-old face of the franchise whose leadership tactics have been questioned publicly by former teammates (including Hines Ward and Emmanuel Sanders, among others). But for all of the criticisms of Roethlisberger's behavior behind closed doors, the Steelers brass firmly believes in Big Ben. “Ben Roethlisberger is unquestionably the leader of this team,” general manager Kevin Colbert said at the NFL scouting combine. Pittsburgh is on the precipice of change. And it’s on those who remain to prove to that recent failures were the result of distractions caused by Brown and Bell — and not the consequence of something far deeper and far more difficult to admit. The fate of the franchise falls on an aging quarterback who has the full support of management and uses the media as a means to call out his teammates. In Pittsburgh, it seems, Roethlisberger can do no wrong. “I think I have earned the right to be able to do that with as long as I have been here,” the two-time Super Bowl champion said, during one of his weekly radio spots last season, of his penchant for criticizing guys publicly. “And I’ll just be just as critical of myself [in the media], as well. The Steelers also must be honest about the challenge that lies ahead for Tomlin. It was a foregone conclusion that Pittsburgh would part with Brown in the next year or two due to his age, mounting frustrations and the emergence of 22-year-old receiver JuJu Smith-Schuster. Similar to backup James Conner seamlessly supplanting Bell as the Steelers’ workhorse, the stage has been set for Smith-Schuster to be the new star on offense. And he knows it too. “I’m ready,” the 2017 second-round pick tweeted in the immediate aftermath of the reported trade involving Brown and the Raiders. But it takes more than just good players to field a playoff-caliber roster. It takes discipline. Talent. And, above all else, cohesion. That’s a trait the 2018 Steelers desperately lacked. With each drama-filled incident that surfaced last season, it became increasingly clear that Tomlin had lost control. No longer were the Steelers skilled at keeping things in-house. The bad blood that existed between select players and management had seeped into the public domain, and there was no way — despite what Colbert now says publicly — to corral the negative headlines and the sideshows that caused them. For Pittsburgh to be successful in the absence of two of its biggest offensive stars, Tomlin must do a better job of managing his quarterback, and find a way to once again lead his team deep into the playoffs. If he doesn’t, he might be the next big name to part ways with Pittsburgh. At the slightest sign of strife, there will be no more divas left to blame for the franchise’s missteps. There will only be Tomlin. And, of course, Roethlisberger. The quarterback adept at publicly doling out blame.